Thrills Casino will then reward you with a bonus (Welcome Bonus is for new players only). The terms and conditions of the bonuses vary between different casinos and might also change over time and between different countries, so it is important to compare the different offers and read the T&C for Thrills Casino before signing up. owner and operator of several online gaming sites, each partnering with the industry’s tops software providers and regulated by Malta Gaming Authority and the UK Gambling Commission. 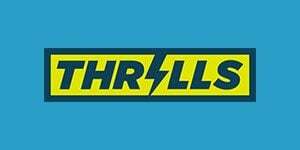 Thrills casino is powered by NetEnt, although the entire offer includes over 700 games released by several providers: Microgaming, Betsoft, Play n’ GO, NYX, Evolution etc. The games are divided in 8 categories: Featured, Video Slots, Jackpot, Classic Slots, Bonus-o-Meter, Live Casino, Table Games and Other. The last category consists out of Video Poker, Scratch Cards and Pontoon, while Bonus-o-Meter tab is a special section that only includes games which will help you progress on the Bonus meter and unlock free rounds on the selected slots. The latest slot releases are usually placed at the very top, although you can also do a name search if you are looking for a specific title – Secrets of Atlantis, Copy Cats, Pied Piper, Jurassic World, Immortal Romance and many others. In fact, it is difficult not to find what you are looking for on Thrills. The platform also allows you to play multiple slots at the same time and once you launch the selected slot, you will have the option of adding up to 4 more slots (the same option is also available for the rest of the games). Once you launch the game, the Leaderboard will be available to the right, displaying the latest winners, number of points won and jackpots awarded within the Lighting League Race. This category features Roulette, Poker, Keno, Blackjack and an extremely simple yet highly contagious Beat Me card game. If you are intimidated by the Live Tables, Table Games will be an ideal workout platform, especially if you are still working on developing your strategy and understanding the betting system. Traditionally, this section has the most modest gaming offer and Thrills casino is no exception. Not the most thrilling category but the fans of Poker and Scratch Cards games will find a few interesting variants. Live Dealer tables are probably the most exciting part of the offer for most of the members and Thrills does not disappoint with its Live Tables selection, although it seems that Blackjack players are somewhat privileged. Players who prefer games of chance will have a few Roulette variants to choose from, including Dream Catcher and a couple of Poker tables. All of the Live Casino games are provided either by Evolution or NetEnt. 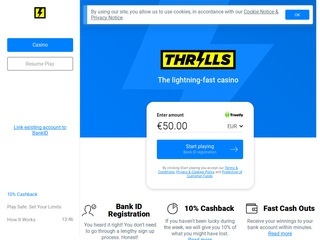 As soon as you subscribe, Thrills will greet you with their Welcome package, doubling your first deposit on any amount up to €100 and awarding 50 Free Spins, 10 of which will be immediately available after you submit the first €20 minimum deposit. The rest of the Free Spins will be awarded in instalments for the next 4 days. The withdrawals of any winnings generated from Free Spins and Bonus Cash will be allowed as soon as the x40 wagering requirements are met. Selecting any of the games inside the Lighting League Race promotion will qualify you for the casino race, which will result in up to €100 Free Spins value. Depending on your position on the Leaderboard, the minimum amount that can be won every day is €10 or 5 Free Spins. The hump day in Thrills casino is probably the most exciting part of the week, thanks to Midweek Madness Lightning League Happy Hour, which will double the race pace. On Sundays, the race will be twice as fun as all the points you win by playing will be counted double in Sunday Funday weekly promo. All the freebies that you managed to earn throughout the casino promotional program will be safely stored inside your very own Freebies Vault. To submit the first deposit or request a withdrawal, you can use payment cards, e-wallets or opt for a bank transfer. The accepted cards are VISA and MasterCard, however if you would rather cut down the processing time to 0-24 hours, Neteller, Skrill, Trustly or Zimpler are recommended. The available methods will also depend on you location while the withdrawal limit varies in accordance to the selected payment platform. Currently, Thrills casino does not have any available phone lines, but the players can communicate with the casino customer support representatives via emails or Live Chat, available 24/7. The great thing about their chat system is not only the fast response time but the fact that you can quickly resolve pretty much any issue, as the Chat Box allows the users to attach documents and screenshots.